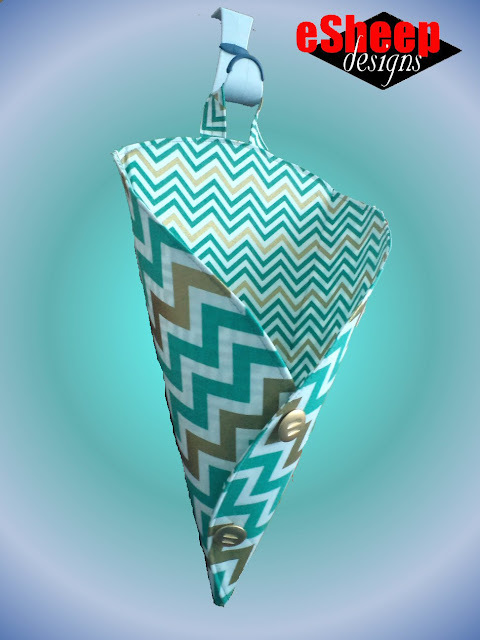 Had a hard time coming up with a name for this thing, but here you go, imaginative or not. 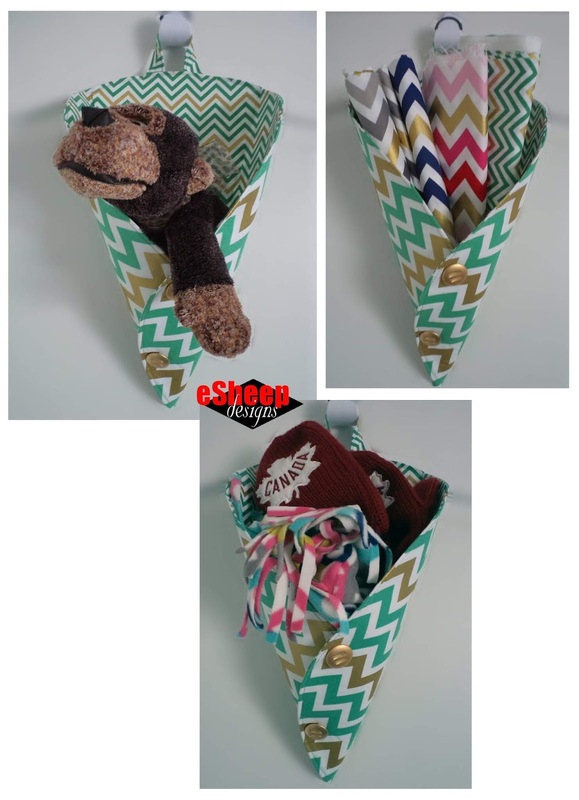 The finished object reminds me of a waffle ice cream cone and its main function is to be a container that hangs, therefore: Waffle Cone Hanging Basket. If the name lacks imagination, maybe you can give me props for where I got the inspiration. The idea came from a chocolate wrapper. Received a box of assorted Lindt pralines for Christmas and one of them was wrapped up in a shiny gold cone. When I unfurled it, it revealed itself to be a simple circle. 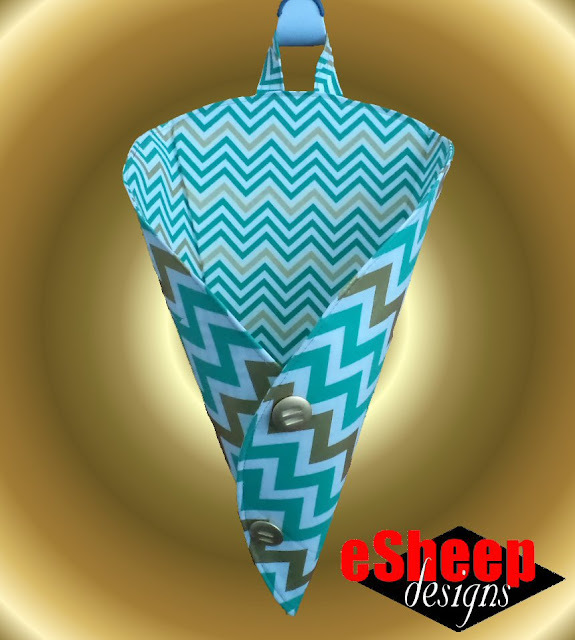 Well, immediately I thought that all I had to do was sew up a fabric circle, interface it appropriately, and it could be manipulated into the same cone shape to become a unique storage solution. 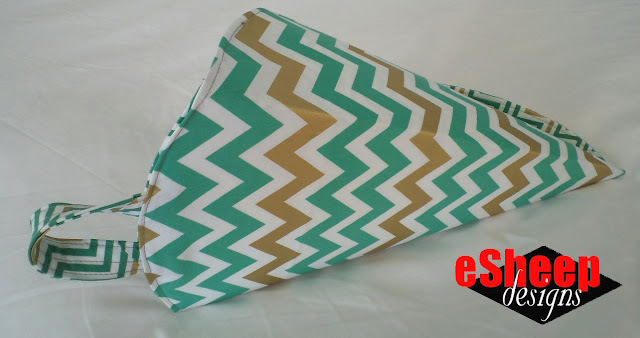 In a way, it's very much like the Portable Pocket Pouch, except that one was made out of a fabric triangle. Since you start with a circle, nothing could be more versatile to size up or down and you don't need a pattern. A couple of coordinating fat quarters will net you a basket like the one that I show here, which measures about 16.5" (approximately 42cm) from top edge to tip. I added a hanging loop by sewing up a simple "no turn" strap, but you can also use ribbon as an alternative. 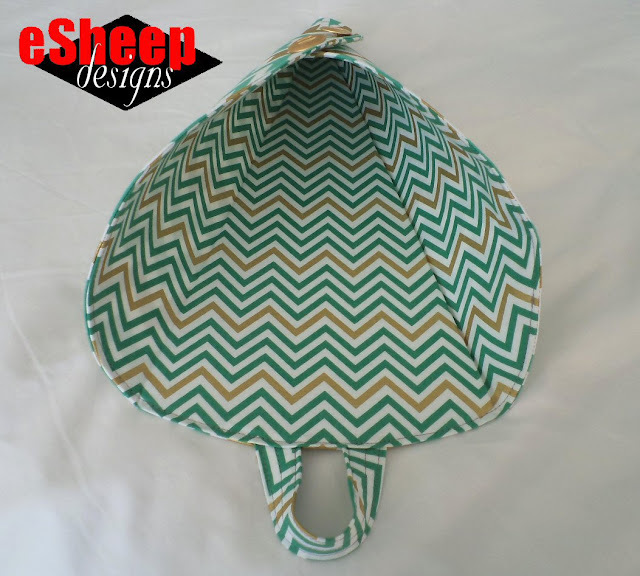 Other materials required are Peltex (or equivalent firm stabilizer), some Decor Bond (or similar medium weight interfacing) and a couple of buttons. 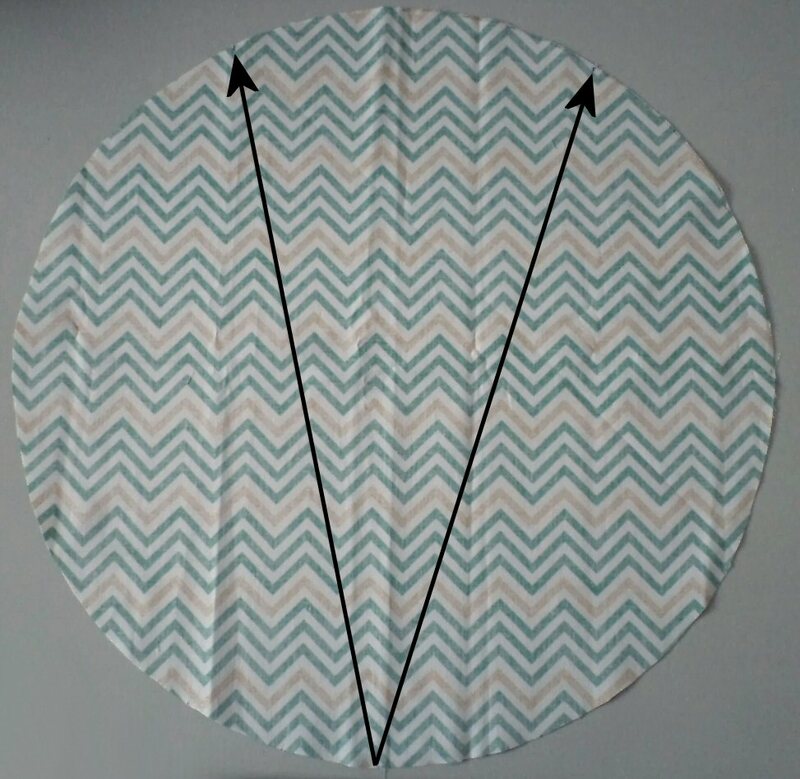 I only interfaced the inside (lining) circle. 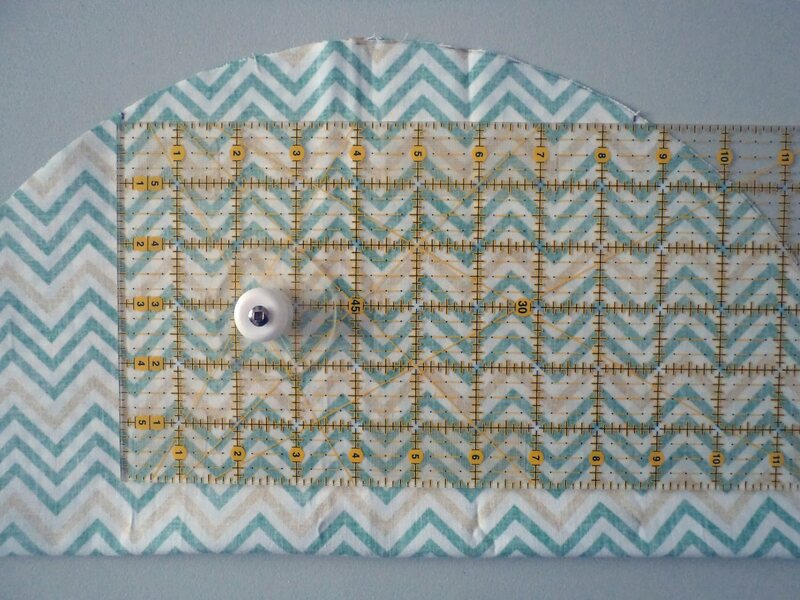 After gifting my quilted hanging file organizer, I took a second look at the fabric remaining from that project and thought to myself, that's actually quite a nice combination. So my RK Remix Metallic bundle was put to use again. What this basket can do for you will depend on how big you make it, but there are plenty of possibilities. In this size, it's a multi-purpose storage solution for kids. For example, we've been under a severe cold snap where I am, so it would be handy to have one of these baskets hanging underneath every kid's coat to keep mittens, scarves and hats together. In a kid's bedroom, it can be a home for small stuffies. 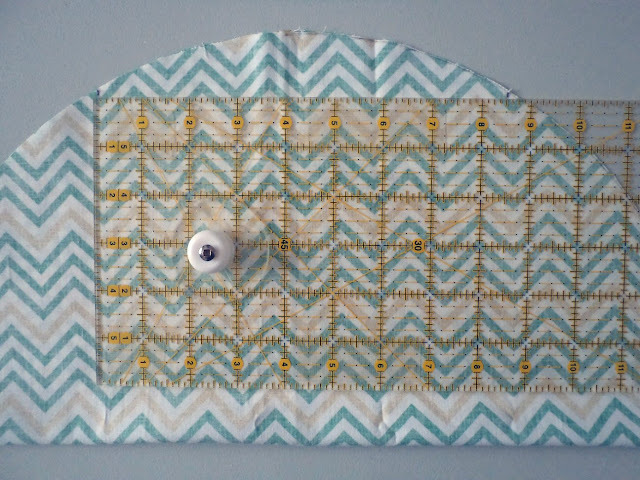 Or hang it beside a crib to keep bibs and burp cloths handy. Toys? Fabric? Winter's warm woolies? I mentioned recently that it's helpful to keep your fabric in view to inspire you. Perhaps a wall lined with baskets filled with fabric or yarn will boost your creativity level. 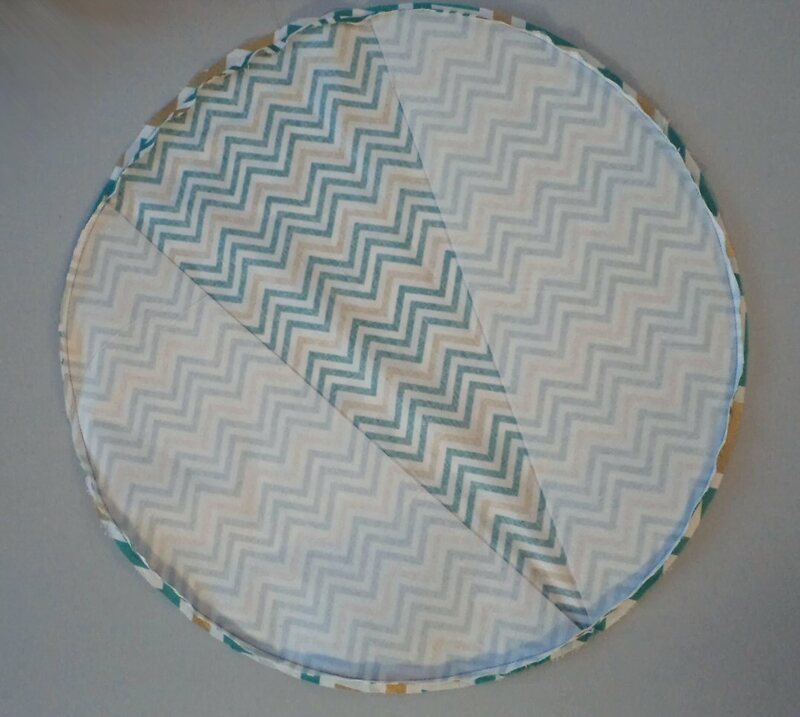 If you want circles bigger than the size of a dinner plate, use the following technique. Take a square of fabric, fold it in half, then fold it into quarters. Measure the distance along one of the folded edges, ensuring that the end captures all four layers of fabric. Use that measurement to make marks every two inches or so from the folded "point" all the way out to the edges of the fabric. Before proceeding any further, take a look at your fabric selections and determine which one will be the exterior and which will be the lining. Next, you'll take the lining piece and mark off the three sections that will form the flat back area and two "wings" that curve around to the front. To do this, first measure across the width of your circle; i.e., the diameter. Mine was 17". Divide by 2 to arrive at the width of the back panel. In my case, that was 8.5". You can see below that I made two marks along the top edge of my lining circle 8.5" apart. It helps to fold the fabric in half to ensure that you're measuring straight before you make these marks. 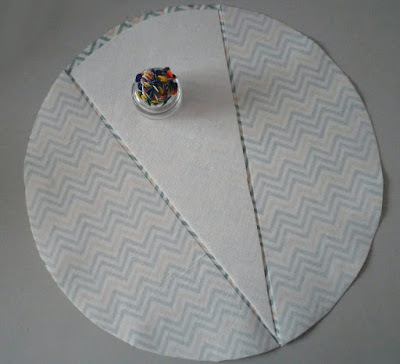 Fold the circle in half again (i.e., into quarters) so that you can mark the middle of the circle along the bottom edge. Use this third mark as a reference to draw two lines as shown below, joining the bottom middle to each of the two marks along the top. By the way, if your fabric has a directional print, ensure that you have it oriented correctly before you do this. The two side sections of the lining will be interfaced with the medium weight fusible, while the middle back section will be interfaced with something stiff like Peltex. 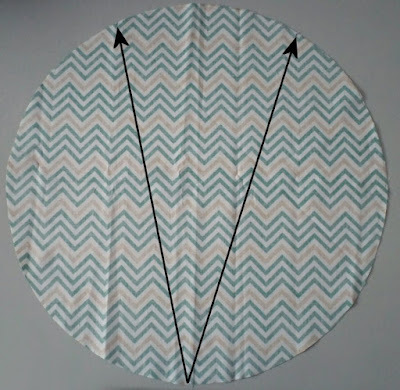 Use one of the "wings" of the lining fabric as a template to cut two pieces of Decor Bond. Cut around the outside curved edge of one of the side panels. When you get to the straight edge, just flip the fabric back onto itself and continue cutting (or tracing) around it. 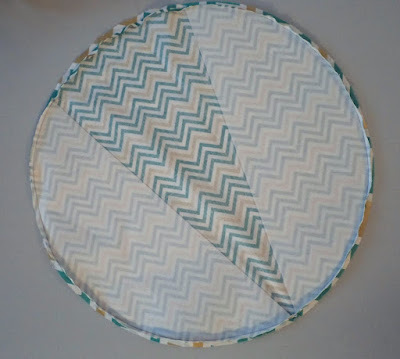 Be sure to cut one piece with the fusible side up and the other piece with the fusible side down, since the two sides are mirror images of one another. When you cut the piece of Peltex for the middle section, cut it about 1/4" smaller all the way around. You can go ahead and fuse the two side panels with the Decor Bond, but do NOT fuse the Peltex yet. With right sides together, pin the two fabric circles in preparation for sewing. Pay attention to how the exterior fabric is oriented if that matters. Sew all the way around (seam allowance totally up to you; I used 1/4" or 6mm), but leave most of the top open between the marks that you made originally. This will be the turning gap as well as the opening to insert the Peltex. Press it again after turning it right side out, paying particular attention to the opening. Because of the curvature, it's a bit finicky, but again, doing this will make it easier to sew up later. Next, insert the piece of Peltex and fuse it into place. Note that you may have to trim off the pointy end to make it fit. I'm not going to discuss how to make a hanging loop. If you've ever made a bag, you've made a strap and that's exactly what you need to do here. That said, the actual type, size and length will be up to your discretion, based on how big the basket is and how you intend to hang it. Mine was finished to about 3/4" wide and 7.5" long and was interfaced with a single strip of Decor Bond (3/4" wide). Embed the ends of the loop at least a 1/2" or 12mm down inside the seam. Clip securely and sew all the way around with a small seam allowance to finish. All that remains is to manipulate the sides to the desired angle — the bottom should come to a point — and secure them in place by sewing on a couple of buttons. My buttons were part of a bag from a discount store. The brushed gold tone goes quite well with the gold accents on the fabric. I don't like to make things that I don't have a use for, but one can't avoid the "making" part when one gets inspired to create a tutorial. So while I didn't have an immediate use for this basket, I thought at some point I might. Last week, it became a housewarming gift when stuffed with some artificial greenery. How might you switch it up? With "waffle" in its name, I can see this being quilted, at least the side pieces (probably wouldn't want to quilt on top of Peltex). 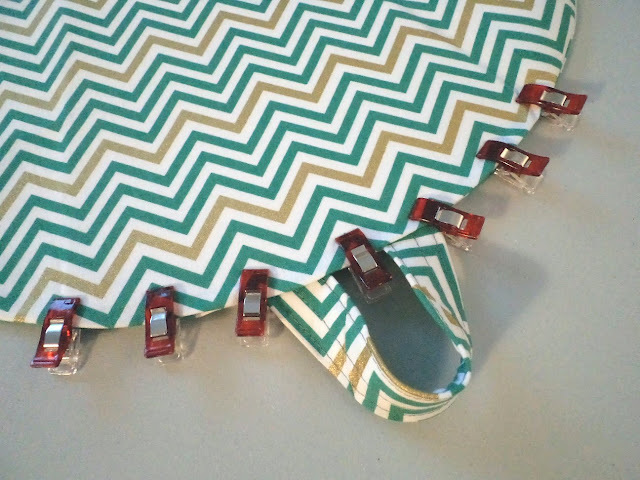 In that case, substitute the medium weight interfacing with fusible fleece. 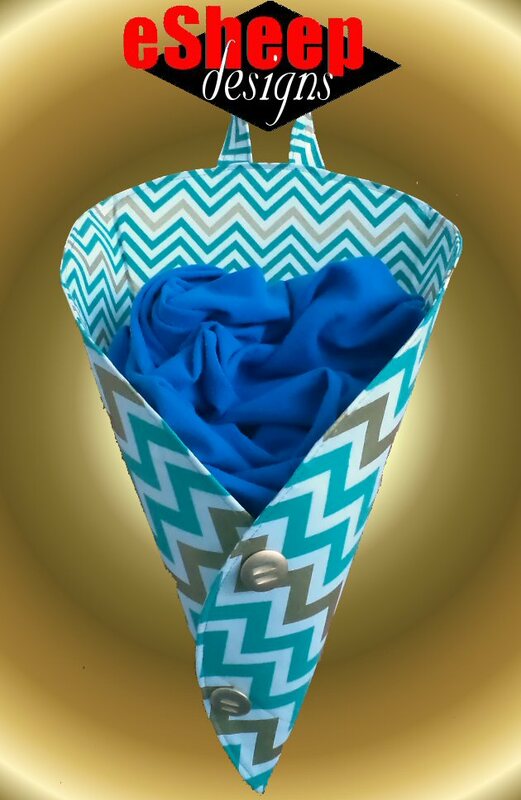 What will you use your Waffle Cone Hanging Basket for? If the curved top edge — where the Peltex piece is inserted and then the opening sewed closed — gives you fits just thinking about it, level it off and turn it into a straight edge. It won't look the same of course, but functionally, it won't make much of a difference. So there you go — another example of how inspiration can come from the oddest places!